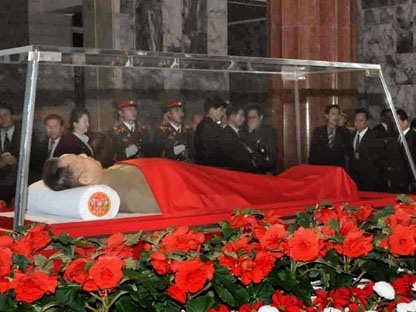 (Leonid Petrov, The University of Sydney) Speculations about the Last Will and Testament of the late North Korean leader Kim Jong-Il, who died on 17 December last year, are mounting and raise many questions about the future of inter-Korean relations. Separate parts of the alleged document have been recently obtained by the South Korean think tanks, the Sejong Institute and North Korea Strategic Information Service Centre. The purported Will was obtained via a person very close to a top North Korean official. It says that the North should make peace with the South, but only after the current President Lee Myung Bak’s official term is over. When a new leader comes to power in Seoul, North Korea must avoid a war and should move forward hand-in-hand with the South. Peaceful reunification is named as the ultimate goal for the Kim family, who has ruled the DPRK since 1948. Concrete policies according to the will include that the two Koreas should consider opening the inter-Korean rail, roads and sea links. Moreover, the document also says that if the two Koreas go to war again with each other, the devastation would leave the entire Korean peninsula centuries behind other countries. In its relationship with the United States, the Will insists: “We have to win the psychological war with America. By standing up imposingly as a legitimate nuclear power, we have to weaken the US influence on the Korean peninsula and work toward lifting international sanctions to prepare external conditions for economic development.” According to Kim, North Korea must return to Six-Party Talks, but only to gain official recognition as a global nuclear power state. It is interesting that with respect to China, Kim Jong-Il warns his countrymen to be vigilant, stating: “Historically, China is the country that forced difficulties on our country, the country that currently has the closest relations with us, but could become the country we need to watch most in the future. Keep this in mind and be careful. Avoid being exploited by China.” This frank appraisal explains the perturbed attitude which the late leader had towards his country’s long-term sponsor and ally. Apart from international relations and security, Kim Jong-Il’s last Will elaborates on three other areas: hereditary succession; the adherence to Military-First Policy; and the role of nuclear energy in the development of the domestic economy. As predicted, his youngest son, Kim Jong-Un, succeeded Kim Jong-Il. However, it is his younger sister, Kim Kyong-Hee, who was named as the Executor of the Will. She is the Secretary of the Central Committee of the Workers’ Party of Korea, where she supervises the Light Industry sector. As for Kim Jong-Un, he should be named the Chief of the National Defence Committee within one year of the reading of the Will. Thus, if this document is authentic, we shall see Kim Jong-Un occupying the highest post in the DPRK sometime in late December 2012. In the meantime, the junior Kim has already been promoted to the rank of Four Star General and Supreme Commander of the Korean People’s Army, the First Secretary of the Workers’ Party of Korea, and the First Chairman of the National Defence Commission. The Will also states that the interests of Kim Jong-Il’s children from previous marriages should be protected. The late leader of North Korea requests special care be extended to his eldest son, Kim Jung-Nam, that he be permitted a comfortable life abroad. Kim’s daughter from the first marriage, Kim Seol-Song, is also to be given a special status in the family. Surely, these actions are designed to unite and strengthen the Kim dynasty and to avoid the danger of internal strife. As a result, Kim Jung-Nam will continue residing in China and won’t need to seek asylum in South Korea or in the US. Likewise, Kim Seol-Song will never become a rival to her half-brothers, Kim Jong-Un and Kim Jong-Cheol. Furthermore, the family funds in Samcheonri safe No.216 are ordered to be transferred to Kim Jong-Un, while all state finances (domestic and international) are to come under the management of Kim Kyong-Hee. She and her husband, Jang Seong-Taek, were named as chief political advisors to Kim Jung-Un. As the executor of the Will, Kim Kyong-Hee has gained the greatest influence over Kim Jong-Un compared to other members and figures of other elite groups. Jang Seong-Taek has remained at the top of the political pinnacle of North Korea, but his role is limited to supporting and advising Kim Jung-Un. There are several other people whom Kim Jong-Il wanted to see as military and economy advisors to his successor, but they will continue to play secondary and temporary roles, not having enough authority to make executive decisions. These days, North Korea watchers in South Korea and overseas are debating and evaluating the veracity of this document. There is no consensus yet, but the “Will of Kim Jong-Il” helps us understand the current situation in North Korea and tells us much about the direction which the country is likely to advance. After reading the Will, one can realise the nature of sudden and hardly explicable actions perpetrated by North Korea after the death of Kim Jong-Il. For example, the ongoing aggressive anti-Lee Myung-Bak campaign can be better understood as an effort to inculcate in North Koreans the thought that no dialogue or reconciliation with South Korea is possible until the incumbent president is gone. Similarly, the recent launch of the ballistic missile, as illogical as it may look, appears more like a careful calculation, where food aid and improved external relations were sacrificed by a regime desiring to boost the pride and confidence of the population on the eve of important national holiday, the centennial anniversary of Kim Il-Sung’s birthday. Most importantly, the “Will of Kim Jong-Il”, whether authentic or fake, emphasises the importance of inter-Korean relations and encourages Koreans in the North and South to resume dialogue and cooperation. Despite the belligerent rhetoric, which leaders of the divided country use to attain their immediate political goals, the long-term goal for all Koreans is peace and security. This can be achieved only if Seoul and Pyongyang make reconciliatory steps, re-building trust and respect toward each other. Read the Korean version of this article here… 김정일은 무엇을 원했을까?